The ‘squared_loss’ refers to the ordinary least squares fit. ‘huber’ modifies ‘squared_loss’ to focus less on getting outliers correct by switching from squared to linear loss past a distance of epsilon. ‘epsilon_insensitive’ ignores errors less than epsilon and is linear past that; this is the loss function used in SVR. ‘squared_epsilon_insensitive’ is the same but becomes squared loss past a tolerance of epsilon. Whether to use early stopping to terminate training when validation score is not improving. 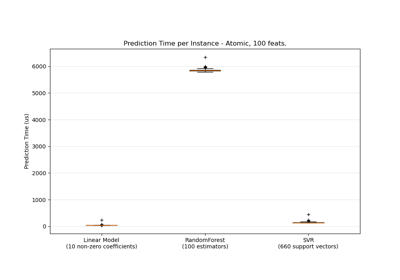 If set to True, it will automatically set aside a fraction of training data as validation and terminate training when validation score is not improving by at least tol for n_iter_no_change consecutive epochs. Averaged weights assigned to the features. partial_fit(self, X, y[, sample_weight]) Perform one epoch of stochastic gradient descent on given samples.